The Loft Film Fest features groundbreaking indie films, old classics and everything in between, along with special guests and even a Calexico Concert. 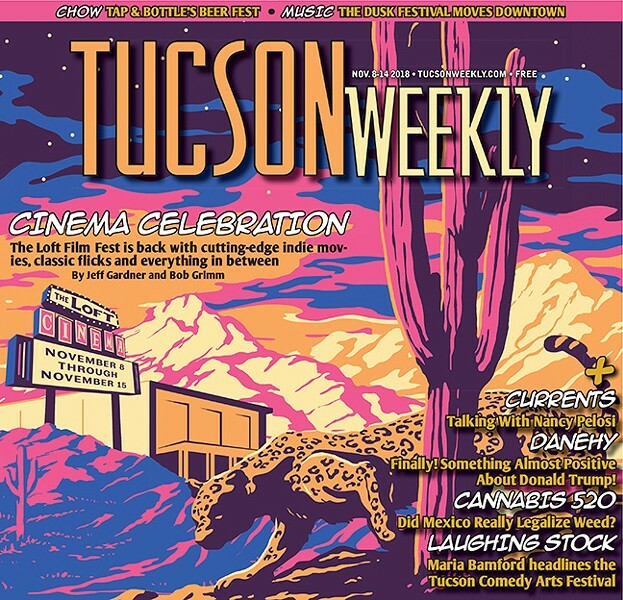 The 9th Annual Loft Film Fest looks to be a typically great affair, featuring some terrific odes to film history, along with the Tucson debuts of some notable 2018 indie efforts. The festival kicks off with Roma, director Alfonso Cuaron's (Gravity, Harry Potter and the Prisoner of Azkaban, Children of Men) Mexico City family drama set in the '70s. The film was a big winner at the Venice Film Festival and will soon be streaming on Netflix (the streaming service produced the film as part of their new, massive effort to be an original film giant). The movie screens on Thursday, Nov. 8. As in years past, the festival organizers have put together a formidable, eclectic lineup of movies that promise something different with every ticket. I had the chance to screen a couple of them before their festival debuts. I recommend these films with much enthusiasm. The Great Buster: A Celebration: Film lovers won't find a better documentary this year when it comes to the art of filmmaking. This is director Peter Bogdanovich's (The Last Picture Show) love letter to the great Buster Keaton, the silent film star who, along with Charlie Chaplin, established himself as one of the silent film era's greatest comedic treasures, along with being an amazing stunt daredevil. Bogdanovich narrates this uniquely constructed documentary, which looks at Keaton's entire career for the first hour, then goes into a further examination of his masterpieces from the 1920s in its final chapters. Keaton had a career that spanned many decades. His final film was a hilarious supporting role in 1966's A Funny Thing Happened On the Way to the Forum. That performance came 40 years after his silent film masterpiece, The General. An amazing collection of interviewees show up in support of Keaton, including Bill Hader, Carl Reiner, Mel Brooks, Werner Herzog, Quentin Tarantino and, of course, Johnny Knoxville, who basically owes his entire film daredevil career to Keaton. If you are familiar with the work of Keaton, you'll be in heaven watching this. If you don't know who he is, I couldn't think of a better introduction. The film screens on Saturday, Nov. 10, and Monday, Nov. 12. Prospect. On a nothing budget, directors Christopher Caldwell and Zeek Earl have come up with a visual stunner, and what will surely amount to one of the year's better science fiction offerings. Jay Duplass and newcomer Sophie Thatcher star as Damon and Cee, a father and daughter living a meager life scavenging for strange, organic gems in the toxic forests of an alien moon. Filmed in the forests of Washington State, the movie manages to create an alien world vibe better and more convincing than most sci-fi films that spend mega-millions. Pedro Pascal (so good in Kingsman: The Golden Circle) pulls off a nice acting feat as a treacherous character who might have some heart after all. He and Thatcher play well off each other as Pascal's character becomes more pivotal in the plot. Knowing that the film was produced on such a small budget makes the experience that much more memorable. There are no frames in this movie that can be declared cheap looking or subpar. It's a substantial visual achievement, with decent CGI effects to go along with its practical work. The directors hired a group of architects and craftsmen to create the look of their movie, featuring an array of gadgets, spaceship exteriors and interiors. The inside of Cee and Damon's ship looks like it was built out of parts from an abandoned old radio station, and the look totally works. The film screens on Tuesday, Nov. 13.